Have you heard about the power of magnets? Maybe you are thinking about harnessing it to see if it can help you with foot pain or to lose weight? You might be interested in knowing which are the best magnetic shoe inserts to help you. There is not a lot of scientific proof that magnets can help with pain, weight loss, or many other ailments. However, many people find this alternative therapy works. Here are our top picks of insoles with magnetic properties and details on what they might do for you. These insoles have Nikken’s patented DynaFlux technology to give you 100 percent coverage and an intense magnetic field. The opposing magnets have a gauss (measurement of magnetism) rating of between 800 and 1000. They are comfortable and can be trimmed to fit. FULL COVERAGE: The mStrides insole acts like a magnetic field generator in your shoe it afford 100% magnetic coverage on multiple angles. Magnetic field is intensified, producing a flux path that extends farther from the surface. ADVANCE TECHNOLOGY: DynaFlux places individual magnets in polar opposition (positive or negative poles facing each other) at several points, using permanent magnets that can accomplish this, without requiring an increase in Gauss strength. STAY COOL AND CLEAN: Low-density and high-density polyethylene is durable and long-wearing. Does not absorb moisture or odor, to stay fresh and ventilated to keep you cool. CARE INSTRUCTIONS: Surface clean with a damp cloth moistened with a mild detergent or hand wash in warm water with a mild detergent. Air dry. These insoles from the Magnet Jewelry Store are magnetic throughout rather than having magnets placed in specific spots. These magnetic therapy inserts are unisex and can be trimmed to size for men’s or women’s shoes. MAGNETIC SHOE INSOLES - Unisex for Men's or Ladies shoes. MAGNETIC THERAPY - Millions of people wear magnetic therapy for health, pain management, arthritis, carpal tunnel, headaches, to increase Chi, and many other conditions. PERFECT GIFT - This therapy product can be the perfect gift for a loved one or yourself. GET THE SIZE YOU NEED - The insoles come as a men's 12 or 13 shoe size and have cut marks down to 7, and for women's size 10 down to 5. 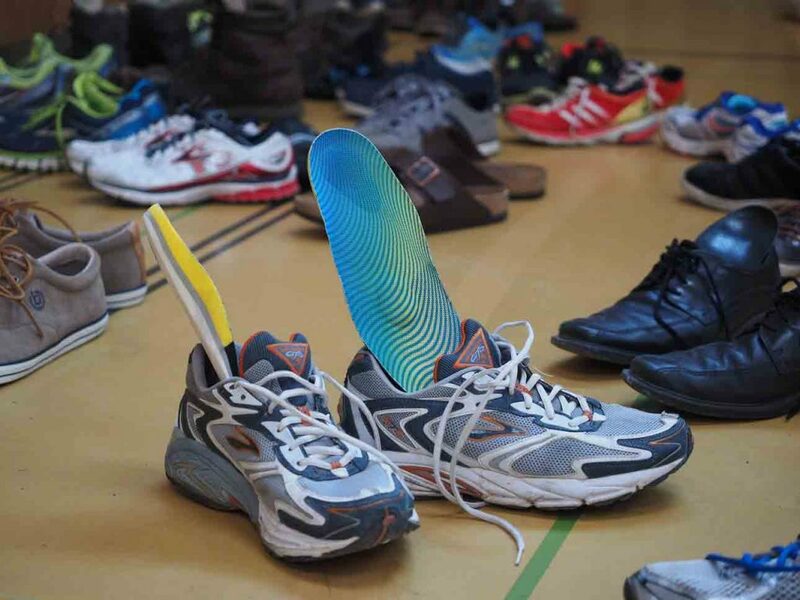 Containing bi-polar magnets, these insoles provide up to 5000 gauss per pair. They have massaging nodules designed to relax and stimulate your feet and body. They might help with foot pain and improve your metabolism, among other things. Promagnet brings us an insole that is 0.10 inches thick and has an internal gauss rating of 2550. The magnets are placed in their patented alternating pole design and run the full length of the foot. The nylon covering helps prevent the insoles from cracking and deteriorating. Insole is a 1/10" thick Flexible magnet - Internal Rating of 2,550 gauss. 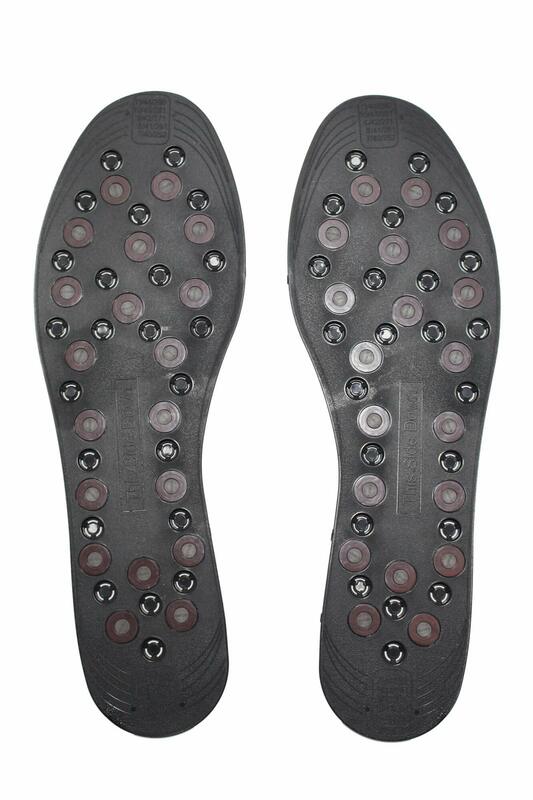 Patented alternating pole design (North/South) allows for deeper penetration than unipole insoles. Unique Heel-to-Toe design offers one solid sheet of magnet for 100% active surface coverage. Smooth surface no nubs or bumps. 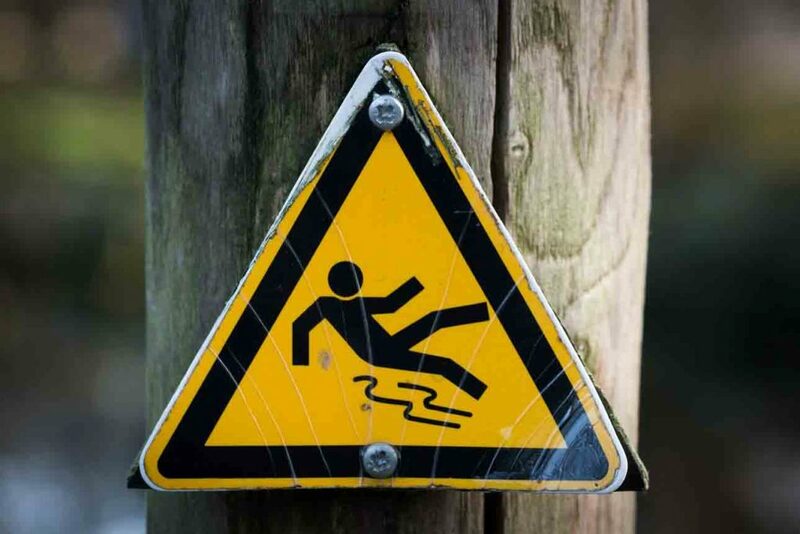 Rugged non-slip nylon covering that resists cracking and deterioration. NOTE: If you are an an exact size, it is best to order one size larger and trim the toe to guarantee fit! 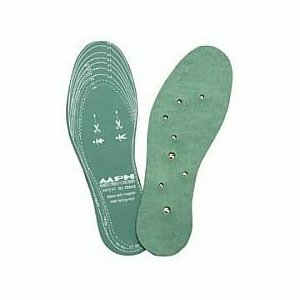 Austin Medical has produced a green foam cushioned insole with eight magnets in strategic places. The gauss rating is 800 per insole, for a total of 1600. The magnets are all Bionorth pole and the insoles can be trimmed to fit. Acupressure and magnets combine in these insoles to stimulate reflexology points in your feet. They might help improve circulation and weaken fat cells to help with weight loss. They are ventilated to help prevent foot odor and let your feet breathe. Eight Strategically-placed Magnets and raised nodes stimulate reflexology points, alleviating mild to moderate foot discomfort and rejuvenating the entire body. These slimming magnets emit magnetic waves which weaken fat cells in your body and help losing weight by walking with magnetic insoles. 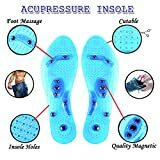 This magnetic massage insole is uniquely designed to relax your muscles and is very effective in the treatment of chronic lumbar sprains. It seems that magnetic inserts can help massage your feet, improve neurological pain, and exert healing forces on our bodies. Here are our top six picks of the best magnetic insoles for weight loss, neuropathy, and other benefits. Nikken sells a number of products in the fields of relaxation, wellbeing, personal care, and nutrition. The mStrides insoles are one of these products. They are designed to create a magnetic field in your shoes giving your foot support and energy flow as you walk. The insoles are available in one size for men and also one for women. They can be trimmed to fit inside your shoes. They are made from low and high-density polyethylene and have ferrite magnets. The durable surface does not absorb moisture and is ventilated to keep feet fresh. Nilkken’s patented DynaFlux technology supplies between 800 and 1000 gauss. It gives a 100 percent coverage magnetic field. The insoles can be cleaned by using a damp cloth with mild detergent to wipe them over or by handwashing. They should be air dried afterward. The company does issue a warning, however, to those who use electronic devices for medical reasons. It is best to not wear magnetic products if you have a pacemaker or surgical implant that could be magnetically sensitive. They also suggest that if you have any health problems, or are in the first trimester of pregnancy, to consult your physician before you use magnetic products. 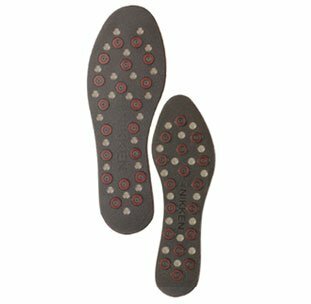 These magnetic insoles are made from durable polyethylene and are impregnated with magnets supplying between 800–1000 gauss. They can be cleaned easily and have ventilation to let your feet breathe. The Magnetic Jewelry Store brings us a unisex insole which can be trimmed to size. Thye fit men’s shoes from a 7 through to 12 or 13 and a ladies shoe from sizes 5 through to 10. They are magnetized throughout and could help with pain management, arthritis, headaches, general health, and other conditions. The magnets are encased in a fabric outer. The company warns that these insoles should not be used if you have any medical device implanted or are pregnant. You should also consult a doctor before use. They also disclaim against the insoles being a treatment, cure, or mitigation of any physical condition. Available in one size that can be trimmed to fit. Might help alleviate pain and help with other health issues. Magnets are encased in fabric. Some find they feel no benefits. These insoles are magnetized throughout and might help with some health conditions. They have a fabric outer and are suitable for men and women. Billy The Tree Jewelry brings us this pair of bi-polar magnetic insoles with both north and south pole magnets. They also have added massage nodules to target reflexology points in the feet. The total strength of the gauss of these insoles is 5000 and the magnets run right through the insole. They are suitable for both women and men. A chart is included with each pair enabling you to cut the insoles to sizes between a 5 and an 11. Durable and hard wearing, these can be placed in shoes, boots, and even slippers. The insoles might help provide some relief from foot pain while relaxing your feet. They could also help with muscular pain and aches, back pain, fatigue, and headaches. It’s possible they could improve your metabolism, which would make them good magnetic insoles for weight loss. It is not advisable to use this product if you have an allergy to metal or have an electrical implant. One size can be trimmed to fit. Could help health conditions and weight loss. Massage nodules might take some getting used to. 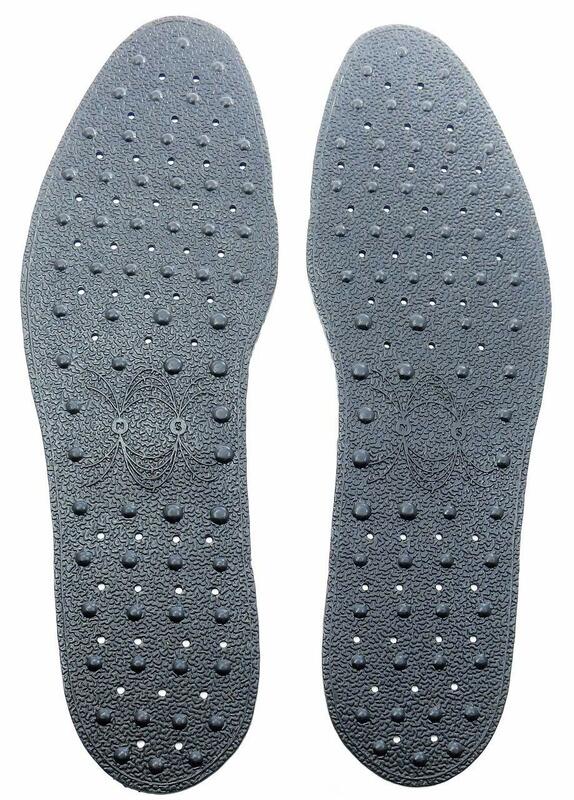 This insole is durable and can be used in any footwear. There are 5000 gauss per pair and the bi-polar magnets are distributed throughout the insert. Massage nodules target acupressure points in the feet. 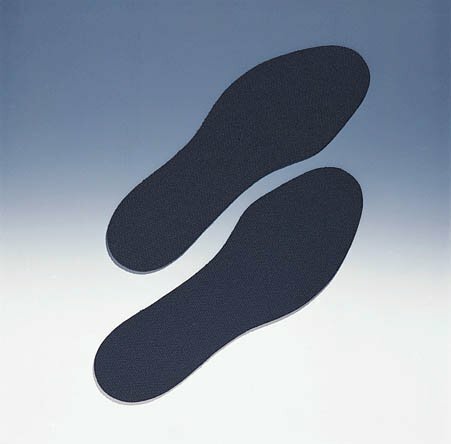 This insole from Promagnet has a patented alternating pole design. There are both north and south magnets allowing the magnetism to penetrate further into the foot. The internal gauss rating is 2550 and is flexible, covering 100 percent of the foot. It is 0.10 inches thick and has a smooth surface. The nylon covering is both hard wearing and non-slip. There are four sizes available from small to XXL. Suitable for both men and women, they can be cut to size and cover up to a men’s size 15. The manufacturer advises the inserts might help make a difference to circulation and blood flow to your feet. They might also help with neuropathy caused by diabetes. Once again, people with pacemakers, implanted electro-medical devices, or those that are pregnant should not use these insoles. The company also warns that its product is not sold to cure any disease and make no guarantee as to how effective they may be. Flexible magnetic strip throughout the insole. 2550 gauss per insole (total 5100). They don’t seem to work for everyone. Some find them too thick. A bi-polar patented flexible magnetic insert with a total gauss of 5100. They are available in four sizes covering men’s and women’s feet up to a size 15. Austin Medical has been supplying medical products for over 30 years. These magnetic insoles are one of the many commodities they stock. Measuring 11 inches long, they can be cut to fit both men’s and women’s shoes. They have foam cushioning to give extra comfort. Eight magnets are placed in each insole in strategic places to give a gauss of 800 each. All the magnets are polarised to the north. Might not be big enough for larger sizes of feet. These insoles are cushioned for comfort and contain eight magnets, all of the north polarity. They have a gauss of 800 each (total 1600). One size can be cut to suit men’s or women’s shoes. 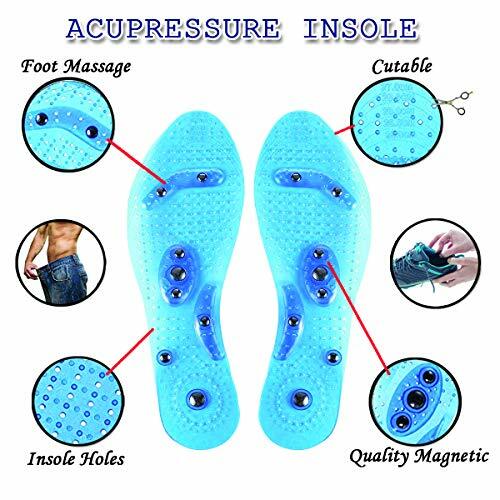 Mindinsole manufactures acupressure insoles with magnets which they advise can help relieve pain and aid weight loss. They apparently target energy zones in specific places in the body to increase blood and oxygen flow. This one size insole is made from medical silicone and is lightweight. One size can be trimmed to fit in any shoes for men and women. They have eight magnets placed at the arch, heels, and ball of the foot. Raised nodules help to massage acupressure points throughout the feet. They claim to weaken fat cells in the body as you walk to help you lose weight. They also claim to increase blood circulation, which in turn provides pain relief. They have 250 air holes to help keep your feet ventilated, fresh, and cool. Might help with weight loss and pain relief. Eight specifically located magnets for therapy. Some find they are a bit thin. Made from a breathable medical grade silicon, these insoles have eight magnets that might help with pain relief and weight loss. They are one size and can be trimmed to fit any shoes. Do Magnets Have the Capacity to Treat Medical Problems? Magnetic therapy for many ailments has made a resurgence in recent years. It has become a popular alternative treatment for many medical complaints including back pain, neurological pain, foot pain, arthritis, and weight loss. Magnet therapy is not a new phenomenon. Its origins can be traced back to about 2000 B.C. where magnetic stones were used to put health imbalances right. The ancient Egyptians also harnessed the power of magnets with legend telling us Cleopatra used a magnetic stone to help keep her looking young. Fast forward to the 1500s where an alchemist and physician, Paracelsus, used magnets to help heal many illnesses. There have then been others throughout history that also believe magnets can promote the body’s energy to heal. 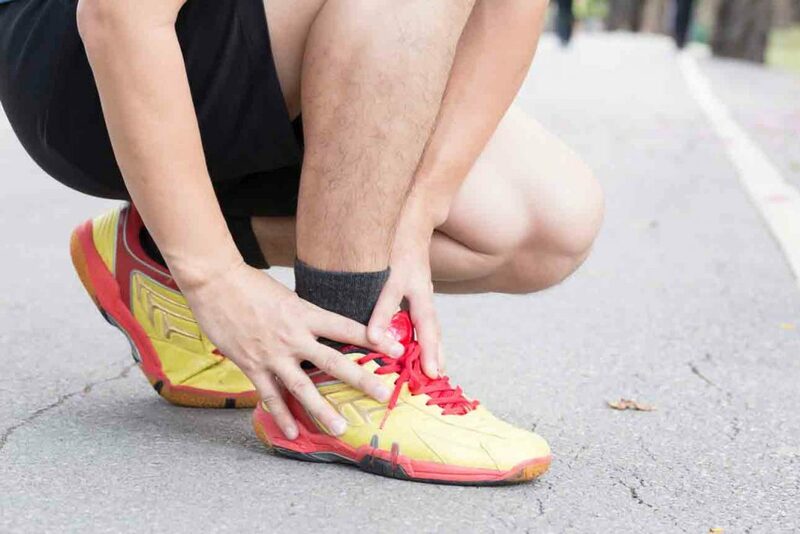 While many people claim to feel benefits from using magnetic therapy such as magnetic insoles, there is little scientific proof to back this up. Our bodies have natural electric and magnetic fields. A small amount of magnetic energy can be found in all the molecules of our body. It’s believed that magnetic field therapy can help correct imbalances in our own magnetic fields. The cells in our body contain things like calcium and potassium which help send signals. Scientists have conducted tests to see how these ions react to magnets but it’s not known whether the effects are the same in body cells. The action of the opposing north and south poles of magnets are purported to relax capillaries which in turn increases blood flow. This might provide pain relief to localized body parts. Magnets could also change nerve impulses, increase the oxygen flow to tissues, and reduce acidity in fluids in the body. There have been a number of studies carried out on the effects of magnets on the body. One study was done by the Mayo Clinic in 2005 on 89 people. Some were given magnetic insoles to wear while others were given insoles with no magnets. Some of the participants felt an improvement in their level of foot pain. However, there was no difference between those who wore magnetized insoles and those who wore the Placebo (dummy) insoles. They concluded that the magnetic insoles used in the study were not clinically effective. That being said, another study was done on 375 participants with neuropathic pain from diabetes. These were from various 48 health centers across 27 different states in the US. Again, some were given dummy insoles and some magnetic ones. The results showed improvements in numbness, tingling, and foot pain in both groups. The difference in this trial was that over time, the benefits of the group with magnetic insoles were about double that of the placebo group. This video explains why this trial was done and highlights the results. So whether magnetic therapy works or not remains contentious. Nevertheless, placebo effects can change how people perceive illness. If they believe in the ability of something, like magnetic therapy, then they might feel benefits. You might decide you want an alternative treatment for foot pain, nerve pain, or to help you lose a few inches. If this is the case and you want to give magnetic insoles a try then these are some features to look out for. Patented technology like Nikken’s DynaFlux place the magnets in a particular pattern to enhance the magnetic field. They place north polarized magnets on top of each other so they repel. This energy is what is used to create the magnetic field and might also give a bit of shock absorbency. This video shows you how DynaFlux magnets work. Reflexology and acupressure have been used for many years to treat any number of ailments. They are pressure points on the body which might help relieve pain or increase circulation by balancing the energy in the body. The feet have many of these pressure points as shown in this video. Look for insoles that have nodules to massage your feet as well as providing a magnetic field. Magnetic insoles may or may not have additional support for your heels or arches. If they don’t then choose a flat, flexible one that can be used with another orthotic. Comfort is paramount when you have painful feet. Look for cushioning from something like foam or an insole that has a sheet magnet rather than individual ones. The way the magnets are arranged can also affect the comfort levels of these insoles. You aren’t going to want to feel them underneath a very painful area of your foot. Gauss is a unit measurement as to how much strength a magnet has. It will usually be quoted for insoles either for each one or as a combination of both. A magnetic gauss rating of 700 to 1000 might penetrate an inch deep in the body. To reach two inches you would need a gauss strength of between 1200 to 2000. Consequently, the higher the gauss rating the more likely the magnets are to be effective. Can Anyone Use Magnetic Insoles for Neuropathy or Weight Loss? Unfortunately, there are some people that should not use magnets as an alternative therapy. These include pregnant women and anyone who has a pacemaker, insulin pump, or any other electric type implant. If you are unsure about whether to use magnetic insoles, consult your medical practitioner. Do Magnetic Insoles Have Side Effects? It appears that side effects from magnetic field therapies are rare. Those that have been reported are nausea, dizziness, and pain. Can Magnetic Insoles Help Me Lose Weight? It seems there is no scientific proof that using magnets in insoles or other devices aids weight loss. In spite of that, there are many people that believe magnetic fields help them lose weight. This could be a placebo effect. After all, if you think something is helping you in your struggle with weight loss and changing your mindset, it could work for you. Provided it’s not doing you any harm then it might be worth giving it a try. Can Static Magnets in Insoles Help with Osteoarthritis? We have mentioned that there is little scientific proof when it comes to the use of static magnets for pain relief. When it comes to osteoarthritis, the indications are that magnetic therapy might work, although more studies are advised. The question is, do the scientists have it right or wrong? There is little proof to back up the claims of pain relief, weight loss, or other health benefits from magnetic insoles. Anecdotally though, many people find lots of magnetic insoles benefits. Just like many other alternative medicinal therapies, there are those that swear by them and those who think they are a load of hocus pocus. The ultimate decision is yours. At best you might find magnetic insoles are the answer to your prayers, at worst, they can cushion your feet and provide some massage therapy. It is worth noting that many companies producing magnetic insoles do not claim that they have medical benefits. They simply state things that they could help with. 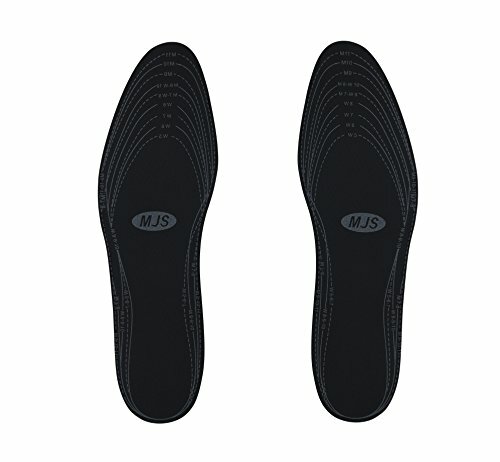 Of the magnetic insoles we have looked at our favorite is the Nikken mStrides. Their DynaFlux patented technology supplies a static magnetic field of up to 1000 gauss to the whole foot. They are durable, breathable, and can be easily cleaned. We hope you enjoyed our insights on the best magnetic shoe inserts and found it useful and informative. Please leave us a comment and don’t forget to share.